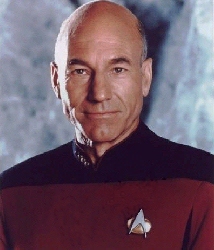 This is Captain Jean Luc Picard, one of the finest Captain's in StarFleet, and Captain of the Enterprise. 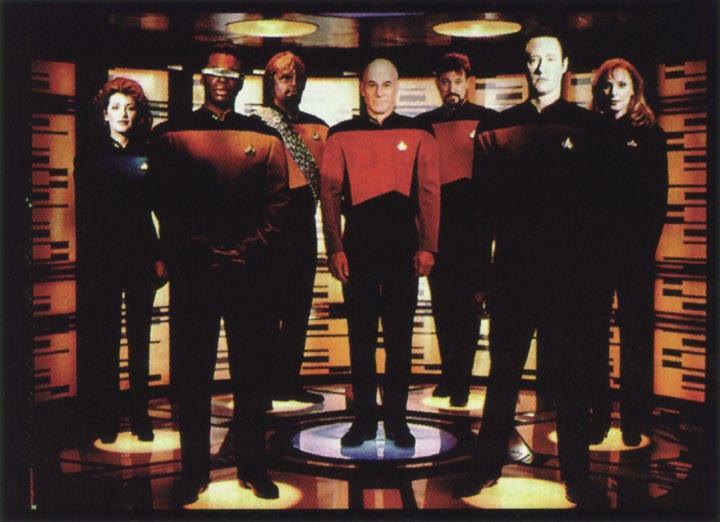 WELCOME TO THE STAR TREK NEXT GENERATION GALLERY! YOU CAN EXPECT TO SEE THE BEST STAR TREK NEXT GEN PICTURES ON THIS PAGE OF MY SITE. I WILL CONTINUE TO POST AS MANY PICTURES AS I CAN. YOU CAN EXPECT TO SEE PICS OF THE CREW ON THE ENTERPRISE E AS WELL. COME BACK OFTEN TO CHECK FOR UPDATES! The Enterprise (registry number: NCC-1701-D) is the most advanced of all the previous starships named Enterprise, and was launched in 2363 from starfleet's Utopia Planitia Yards, and placed under the command of Captain Jean Luc Picard on a mission of deep space exploration and diplomacy. The Enterprise was severely damaged in the Borg encounter of early 2367, and had to undergo six weeks of repair work at Earth Station McKinley. This ship is twice as long as the original starship, and contains approximately eight times the interior space. Much has changed from the first Enterprise to Enterprise-D. The Enterprise serves as a home to 1012 persons, mainly crew and their families. Bridge - it is the center of command, that combines the ship's control room, briefing room, information retrieval center and officer's ward room. Command and control is handled by two bridge duty officers known as CON (command and vessel control duties including helm and navigation) and OPS (vessel operations including communications, engineering and other aspects of ship operations). 10 Forward is the center of the social activity in the ship, located on deck 10, with a splendid view of space when coming into warp speed. Its being ran by Guinan - a survivors of the Borg attack in her world. Every detail of the voyage is guided and monitored by sophisticated sensors and computer operations. A large wall-sized holographic viewer is located at the forward part of the bridge enabling the crew to visually observe happenings outside the ship in any direction and at variable magnifications. This main viewer is also used for communicating purposes. Behind the bridge, the conference lounge is located, lined with huge rear windows, offers a spectacular view of the aft top portion of the saucer section and the rest of the ship. Filled with comfortable furniture and containing complete food and computer access facilities, this room is often used for conferring and counseling on various command related decisions. A transporter beam device allows the crew or cargo to be instantaneously transferred from one location to another. Fifteen transporters are located in various location throughout the ship, allowing transportation in nearly any direction with a range of approximately 10,000 miles. The design of the transporter allows the operator to filter out bacteria, viruses and other foreign matter that may be picked up on an away visit. Holodecks are specialized areas that can be programmed to simulate almost any landscape and weather condition with startling reality are used for training, exercise and recreation. Though primarily designated for scientific research purposes, the USS Enterprise is armed with 12 individual Phaser banks and two photon torpedo tubes (one facing forward and one aft) making her more than capable of defending herself. With warp capabilities - even faster then warp nine, the Enterprise con outrun nearly any ship in the galaxy. In the event of an attack from hostile force, the main hull,saucer, can separate from the battle hull and both can operate independently. This allow the crew of the battle hull section to engage in battle without exposing the crew and civilians in the main hull section to the same danger. -To expand the body of human knowledge. -To provide assistance as required to Earth or Federation colonies, commerce and travelers. -To provide Earth or Federation security. -To seek out new life and new civilizations. -To provide further understanding of the university and humanity's place in it. This is the Crew of The Uss Enterprise. StarFleet's Finest. From Left to right: Backrow- Counsler Deanna Troi, Lt.Cmdt Worf, Commander William T. Riker, Chief Medicial officer Beverly Crusher. Center: Captain Jean Luc Picard. Front Row: Cheif Engineer Geordie LaForge, and Lt.Cmdr Data.